Canadian Music Week announces the 18th Canadian Independent Music Awards – presented by Jim Beam with Indie88 at the Phoenix Concert Theatre in downtown Toronto on May 12. 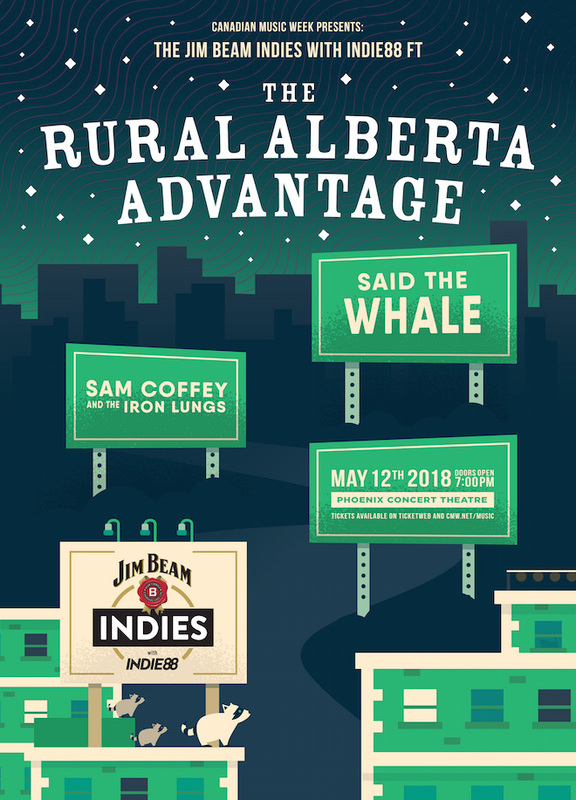 The annual event will feature performances by two time Juno award nominees The Rural Alberta Advantage, Vancouver based indie-folk rock trio Said the Whale, Toronto’s power pop rock band Sam Coffey and the Iron Lungs and the winner of the Jim Beam talent search. Part concert and part awards, the Indies are a celebration of national and international independent musicians making outstanding achievements in this area. Submit your nomination(s!) today for a chance to be recognized among industry peers, media and fans alike. Submissions are being accepted through indies.ca until March 16, 2018. Artists or their representatives (including labels and managers) can submit nominations on their behalf. All submissions completed before March 5th will receive discounted pricing. The eligibility period for all awards categories runs from September 1, 2016 through February 1, 2018. Nominees must have been active during the eligibility period and are based on the performance of the group or artist either on record or in live performances. For complete submission details, eligibility criteria and award categories, see “Criteria” on the Indies website. Celebrating the best of independent music – both Canadian and international – the Jim Beam INDIES with Indie88 will prove to be an unforgettable night for fans and industry alike. Pre-sale: March 1 @ 10:00 am here. General On-sale: March 2 @ 10:00 am here. The RAA’s percussive folk songs about hometowns and heartbreak have taken the trio of Amy Cole, Paul Banwatt and Nils Edenloff from humble recognition amongst indie rock die-hards as “Canada’s best unsigned band” to sold-out tours and devoted fans around the world with featured coverage from Spin Magazine, Pitchfork, The New York Times and Rolling Stone all taking note. The band has been nominated for two 2012 Juno Awards, long listed for the 2011 Polaris Award, awarded the Galaxie Rising Star for Recording of the Year at the 2010 Indie Awards and the CBC Music Prize for Best Independent Artist in 2014. Their fourth album, The Wild, is out now. Now in its 36th year, Canadian Music Week is recognized as one of the premiere entertainment events in North America focusing on the business of music. The Canadian Music Week festival spans 6 nights of performances, with hundreds of showcasing bands at more than 30 live music venues in downtown Toronto. All convention functions take place at the Sheraton Centre Toronto Hotel, 123 Queen Street West, Toronto. ABOUT JIM BEAM BEAM SUNTORY INC.
Jim Beam is the third largest spirits provider in the world, and it comes as no surprise that it would have at its helm the world’s number one selling bourbon JIM BEAM®. Since 1975, we’ve remained true to the Beam family recipe, passed on from seven generations. Today we carry on the legacy of the legendary Beam master distillers and make history in every bottle. Founded in 1988, Central Ontario Broadcasting is an independent broadcasting company that owns and operates three radio stations: Indie88 in Toronto, Rock 95 and 107.5 KOOL FM in Barrie. Indie88 (CIND-FM) officially launched on August 3rd as Canada’s first Indie station- giving great music a home. The station supports the musician behind the song and puts the audience first. Indie88 is committed to providing a platform for emerging Canadian artists and all their fans to experience Indie88, Tune in to 88.1 FM and indie88.com .